In case you missed the 8432875 times I’ve said it over the past week, today (!!) is my 30th birthday. 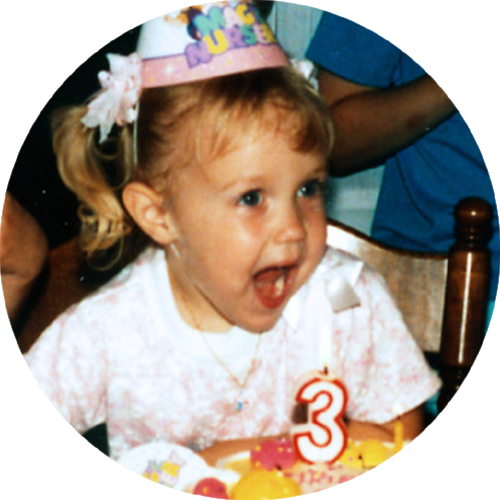 Despite the joy I possessed at age 3, I am not usually a big “OMG PAY ATTENTION TO MY BIRTHDAY” kind of person, but I guess I have been milking this one for a while -- at least in the sense of treating myself… whoops. 30 just SEEMS like it should be a big deal, you know? Like suddenly I should know how to do all the basic, adult-specific things like hard boil eggs or fold a fitted sheet without needing to consult the Internet. Domestic wisdom aside, I do hope that 30 brings a little bit of “street cred.” I’ve always been mature and professional, acting older than my years but looking much younger -- and yes, I know, I’ll like that when I’m older -- but now that I can say “I’m 30,” it just feels like it adds a touch of validation. It also means that I’ve survived my 20s -- and that, in my opinion, deserves a goddamn medal. Not quite as impressive as the first decade (I mean, you literally go from an amoeba to a human being who can read and write and ride a bike), this last one really changed me. It started in the middle of a rough health crisis (but with a very tasty pink birthday cake), saw me through graduation, 3 big moves, 4 big job changes, becoming an entrepreneur, meeting and marrying my husband, buying a house, celebrating so many of my friends doing the same, and finally feeling like I’ve built the life I want to live in instead of just fumbling through whatever’s next. 30 feels like a good number to pull all of that experience together -- it feels solid, complete. But ever the Gemini, I’m always jumping between the two extremes: I live like a ping-pong ball bouncing from “I’m happy, content, whole, and I know what I want” to “Is this it? Isn’t there more? Who am I? What’s next?” and back again. It’s a constant push and pull between feeling like I’m settling in to something good and like I’m just settling. By 30, I’d hoped that the back-and-forth momentum would have dulled -- but it seems that it’s how it’s supposed to be. It’s what pushes me forward and makes me, well, ME. Satisfaction is hard for me to come by, and I joined up with a life partner who also never feels like the work is done. We’re always driving ourselves down new roads, climbing new mountains, and saying “This one will be it.” But here’s the thing: I don’t think either of us wants this to be it. I like the chase, the excitement of starting at another beginning, of seeing just a little bit ahead and knowing I can build something new and better every time. But to find that in the foundation of a stable relationship -- well, there’s that duality again. That’s why 30 feels so important -- it feels like the foundation has been set, and now I can focus on the open space part. With my feet firmly planted, rooted in everything I’ve built and created and become, I’m ready to stretch a little higher into the “what could be” and reach toward the next phase with a steady, solid, permanent set of choices holding me up. Always ready for an excuse to manifest a metaphor, I marked this feeling of “permanence and possibility” in arguably the most indelible of ways: a new tattoo. Yes, it says “Lumos.” Yes, that is a big ol’ nod to Harry Potter. (I never claimed to be cool, you know.) In that magical world, it’s the spell used to light the tip of the wand. I wanted this tattoo to serve as that reminder. I’m always able to control my reaction, to choose how to be, to shift my own perspective. It’s a powerful sentiment, and one I want to use to rule my life. There’s always light to be found. The word is written in my own handwriting, recognizing how important writing -- both as the verb and noun -- is to my life and identity. And finally, it’s a subtle wink to Latin and a group of friends who became family (in some cases, quite literally) and remind me that I’m never, ever alone. As I embark on this next season of my life, I give a big, big thank you to everyone who has helped shape the first 30 years. Your influence, support, and love have become a permanent part of who I am, and I like her a lot. This year, as all of the others have, will bring changes, new adventures, endings, and beginnings. It will be full of friendship, empathy, curiosity, learning, mistakes, little victories, love, and -- as I wish for you every single day -- a whole lot of light. Newer PostA big, confident step.